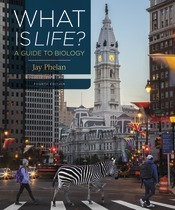 In his popular classes and bestselling textbooks, Jay Phelan uses questions like these as a way of introducing both the practical impact and awe-inspiring wonder of biological research. Phelan knows how to captivate nonmajors with stories of how scientists investigate life. He is also a master at using study of biology as a context for developing the critical thinking skills and scientific literacy students can draw on through college and beyond.